Becoming the first runner to repeat as Dipsea Race champion since 2001 was a worthy enough achievement for Diana Fitzpatrick last year. But being recognized in "Faces In The Crowd" in Sports Illustrated was her crowning moment. 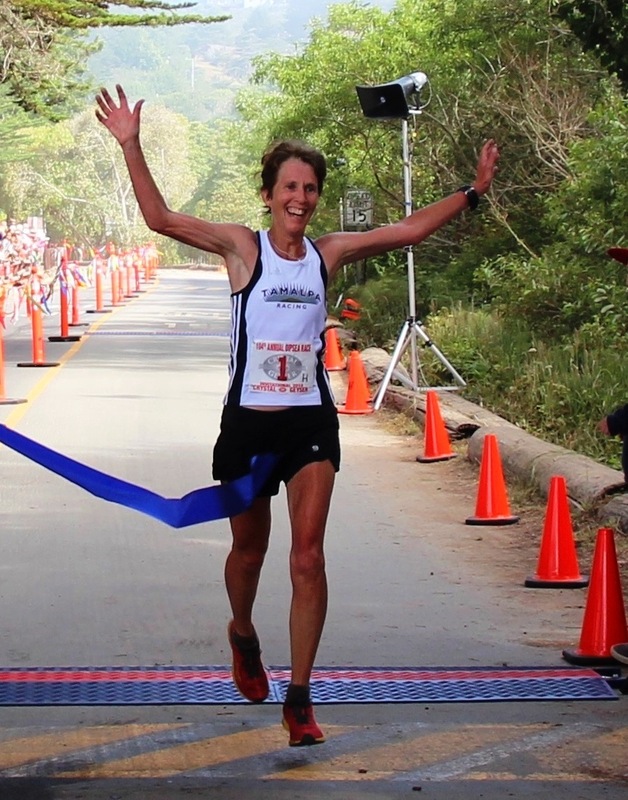 The 56-year-old Fitzpatrick, a NYU School Law graduate who works with Nolo Press, a self-help publisher in Berkeley, became the first runner to win back-to-back Dipseas since four-time race champion Shirley Matson. That feat landed the 55-year-old Fitzpatrick in the July 7, 2014 issue of SI and that earned her more congratulations that she can remember. However, if Fitzpatrick manages to beat the odds and the field for a three-peat at the 105th Dipsea on June 14, she might make the cover of SI. No runner has won three consecutive Dipsea races since seven-time champion Sal Vasquez in 1984. Last year's race will be hard to top. Fitzpatrick won the historic 7.5 mile trail race for the second year in a row, beating Rickey Gates of San Francisco – one of the pre-race favorites – by one minute and 10 seconds. Moreover, Fitzpatrick accomplished this feat after incurring a one-minute champion's penalty from her 2013 Dipsea win. That didn't bother Fitzpatrick as she welcomed running under the radar. "It made it relaxing. I didn't feel any pressure," said Fitzpatrick who finished sixth in her age division in her Boston Marathon debut last April, competing in the same age group as two-time race champion and Olympic gold medalist Joan Benoit Samuelson. "It was fun not being in the spotlight, which is a nice way to go … I know I said I was surprised in 2013 when I won it but in 2014 I meant it." Fitzpatrick, who had a 16-minute head start and built nearly a three-minute lead by the time she reached Cardiac Hill -- the highest point on the course at 1,360 feet above sea -- credited the mileage she logged in preparing for the Western States Endurance Run as helping her repeat as Dipsea champion. "It paid off," she said. "I got to the top of the Dipsea stairs (three flights totaling 688 steps) faster than I normally do. The tough stuff was easier in 2014." Gates, who started 15 minutes behind Fitzpatrick, never saw Fitzpatrick on the course, but heard the cheers for her as she made her final turn onto the finishing stretch at Stinson Beach. Three weeks prior to the 104th Dipsea, Gates finished 27th overall in the Bay to Breakers. He clocked an actual time of 49:31 from Mill Valley to Stinson Beach. "It was really exciting. I have been racing professionally for eight years so I usually know my competitors," Gates said. "She's top notch and this race brings out the best in so many runners." Gates was followed across the finish line by Galen Burrell of Mill Valley, another first-time Dipsea runner, and Alex Varner of San Rafael, who extended his record by winning the Best Time Award for a sixth consecutive year. A scratch runner, Varner posted an actual time of 49:09, which included passing approximately 600 other runners. He also helped recruit Gates and Burrell to join the Pelican Inn Track Club, which won the team trophy. Joseph Biehl of Jupiter Hills was the first boy high school finisher and Andrea von Eschen of Mill Valley was the first girls high school finisher while Tyler Deniston, a 23-year-old from San Francisco, won a trophy as the first finisher from the Runner's Section. The Dipsea first-timer clocked an incredible time of 51.52 to easily qualify for the Invitational Section this year. The starting field for the 104th Dipsea consisted of 1,500 runners ranging in ages from seven-year-olds Luciana Pasquale of Novato and Justin Alley and Zoe Takaraski, both of Mill Valley, to 80-year-olds Porter Davis of San Francisco and Phil Phythian of Mill Valley and Barbara Robben of Berkeley, the newest inductee into the Dipsea Hall of Fame. Runners are assigned head starts based on age and gender. There were runners entered in the 2014 race representing 28 states (and the District of Columbia) from New Hampshire to Alaska plus three countries; England, Switzerland and Canada from Quebec to Vancouver. On the 10th anniversary of the day the award was first presented, the Jack "Demon Dipsea" Kirk Award for "dedication, perseverance and performance over time" was given to Bob Bunnell, who has competed in nearly 50 Dipseas. Bunnell finished second to Kirk in the 1967 Dipsea. The then Terra Linda High School teenager lost to the "Dipsea Demon" by five seconds, yet won the "High School Trophy" that year and nine years later won the "Best Time Award." The Dipsea's Red Tail Hawk Award, also known as the Jerry Hauke Perpetual Award, for "leadership, dedication and sportsmanship" was presented to longtime race volunteer captain Karl Baeck. He first approached the Dipsea Race Committee 28 years ago to volunteer to help the race and for the last 13 years he had been trail captain of the Muir Woods area. The Norman Bright Award – given for "Extraordinary Effort in the Dipsea Race" – was presented to Dipsea Hall of Famer Eve Pell, who celebrated the 25th anniversary of her Dipsea victory in 2014. In 2013, Pell spearheaded a fundraising campaign to build a much-needed water fountain at Cardiac Hill -- the highest point on the Dipsea Trail -- for all people on the trail to enjoy a refreshing drink. The fountain was erected on the spot where she married her husband and Dipsea icon, the late Sam Hirabayashi.